The adoption or purchase of a dog or puppy is an exciting time for anyone and preparation is key to a smooth and happy integration. Before the dog arrives, purchase identification for the dog, some food dispensing toys (adult dogs like these too), a leash and flat collar or harness, baby gate or x-pen and a bed or crate. 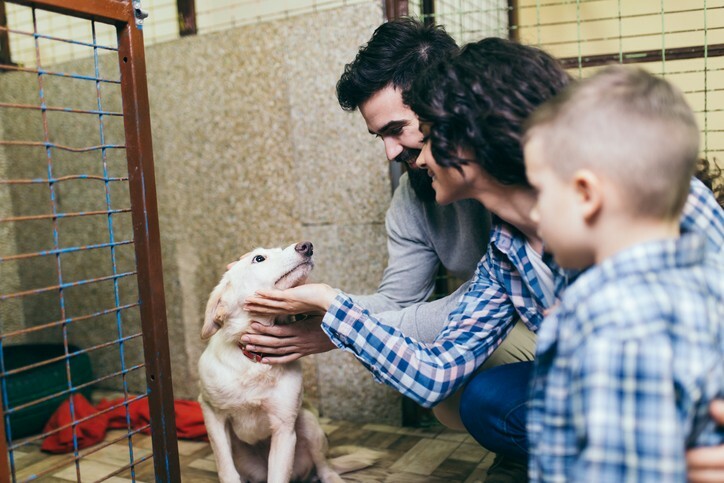 A few precautions can help ensure that the puppy safely transitions into their new home and prevents the development of unwanted behaviors. Decide where the new dog will sleep comfortably and prepare an area. Often a crate (if already crate trained) or dog bed in the bedroom is a good place. For puppies just leaving their litter, the sound of their new humans breathing and sleeping nearby can be comforting. The new arrival may not be house-trained so have somewhere to contain the dog when you cannot actively supervise the dog. I recommend gating off an area for the pup or using an x-pen in a part of the house where the puppy will be able to be with the family and easily be observed. By “house-training” I mean training a dog to live in a house without soiling in inappropriate places and without chewing inappropriate and potentially hazardous items and without damaging items. Put a crate or bed in the pen and, for a young pup, a litter box just in case he needs it (although the goal ultimately is for the dog to do his business outside). Add some non-consumable play toys and a water bowl. As well, have a leash nearby. Take the puppy outside to do his business before leaving him in the pen and be prepared to take him outside if you notice signs that he needs to pay a visit outside. For puppies, mouthing is a natural behavior but can be frustrating for people. This is where food dispensing toys can be very helpful. Feed the pup his meals from food dispensing items readily available from most pet supply places. Fill the food dispensing toy with novel items like yoghurt and blueberries and freeze it. Peanut butter is a popular filler but make sure the peanut butter is a natural one and that it does not contain xylitol which is very poisonous to dogs. This way the dog has an outlet for his need to chew, it’s mentally challenging and his meals occupy him for longer periods than if he eats from a bowl. Adult dogs also appreciate food-filled toys. Dogs often are active morning and evening, so try and play some games with him around those times. Simple games like finding treats in boxes or hiding and praising the pup when he finds you are helpful. Teach the puppy scent games. There are lots of scent game ideas on the internet and, in dogs, the sense of smell is the first sense to be developed and the last to leave as the dog ages. Put away anything that could be hazardous, or that you don’t want turned into a chew toy, as the puppy will not be able to tell the difference between your shoes and his chew toys at this point. Invest in child safety locks for lower cabinets. Garages and sheds can be dangerous places for dogs. Dogs should not be left in garages or sheds. Block access to hazardous items that you cannot move or remove. Before the dog arrives, examine your fencing and fix spots where the puppy could get through. The best type of fencing has several inches of wire buried under the ground (so they can’t dig under) and a fence made of material like solid wood or page wire which prevents a dog from getting through. Puppies should always be accompanied in the yard and never left alone there. Use calming, long, firm, slow strokes when petting the pup. Short, fast strokes tend to get the pup more excited and increase the tendency to mouth. Have fun with your new puppy or dog! Jane Bowers has been training dogs for over two decades. She teaches people to train their dogs in group and private training courses and has a keen interest in assisting dogs with behavioral issues. Her company is Dogs of Distinction Canine Training Inc. Jane has a monthly newspaper column on dog related topics and is a former host of a live call in TV show on animals. She is a strong advocate for force free and humane training methods for all animals. Jane has a degree in psychology and is certified as a dog trainer through the Certification Council of Professional Pet Dog Trainers and as a behaviour consultant through the International Association of Behavior Consultants and through the Association of Animal Behavior Professionals. These organizations require a minimum number of continuing education units be obtained to retain certification. She is also a professional member of "The Pet Professional Guild," an organization committed to force-free training of animals and the "Association of Professional Dog Trainers," a professional organization of individual trainers who are committed to being better trainers through education. Jane is the content creator of the online course "Assessing and Interpreting Dog Behaviour," which is a course for law enforcement personnel who meet unfamiliar dogs in the course of their duties. She is the author of "Perfect Puppy Parenting," a guide to raising a happy, confident, well-behaved dog. Jane spent 17 years working for Customs Border Services and in joint teams with US Homeland Security and the RCMP. She spent a further 8 years working as an Animal Control Officer and Bylaw Enforcement Officer. Jane lives on a small farm with dogs, sheep, donkeys, and chickens. The dogs each came from situations that prevented them from living in their original homes. The dogs range in size and age and with the dog training and behavioral work, whether it's participating in the development of an online training course, working with a client's dog or tracking a lost pet or animal.